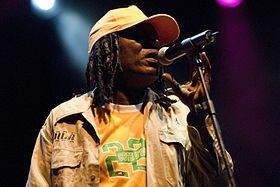 Alpha Blondy (born Seydou Koné; 1 January 1953 in Dimbokro, Ivory Coast) is a reggae singer and international recording artist. Many of his songs are politically and socially motivated, and are mainly sung in his native language of Dioula, French and in English, though he occasionally uses other languages, for example, Arabic or Hebrew. First son of a family of eight children, Seydou Koné was raised by his grandmother, growing up in what he described as "among elders", which later was to have a big impact on his career. In 1962, Alpha Blondy went to join his father in Odienné, where he spent ten years, attended Sainte Elisabeth High School, and was involved in the Ivory Coast students movement. He formed a band in high school, but this hobby affected his schooling and he was expelled due to poor attendance. His parents sent him to study English in Monrovia, the capital city of neighboring country Liberia in 1973. He spent thirteen months there and moved to the United States to improve his English. After various TV shows for Kassi, Blondy recorded his first solo album in 1982, entitled Jah Glory. This album was to have enormous success and would become later a symbol of resistance because of the song "Brigadier Sabari," which documents his experience of being arrested in Abidjan in the 1980s and his subsequent mistreatment by the police. Alpha Blondy became a big star in Abidjan with his African twist of Reggae music, becoming in the eyes of his fans "the Bob Marley of Africa". Alpha Blondy is spiritual, political and positive just like Marley himself, and recorded a cover of Bob Marley's song "War". In order to reach more people with his message, he chose to sing in many languages: English; French; Baoulé, and his native language – Dioula. Later, he also brought new instrumentation to his brand of reggae such as the violin and cello. Back home in 1985, Blondy went into the studio to record "Apartheid is Nazism", a call for the end of apartheid. In 1986, he recorded “Jerusalem” at Tuff Gong studios in Jamaica, again with The Wailers featuring legendary Aston "Family Man" Barrett. Blondy tried to promote unity between the religion of Islam, Judaism and Christianity. He drew his arguments and inspiration from his own diverse knowledge of the Bible, the Quran, and the Torah. That same year, he sang in Hebrew during a concert in Morocco. At this point, he was continuously touring. His new album Revolution had a lighter, gentler sound; this album featured cellos in the instrumentation, and the line-up included veteran Ivory Coast singer Aicha Kone. The album also included "Jah Houphouët parle", a long speech by Ivory Coast president Félix Houphouët-Boigny with only the most minimal beat behind it. Blondy spent the years 1987–89 giving concerts and recording SOS Guerre Tribale in Abidjan. This was promoted by Blondy himself, as he was distancing himself from Pathe Marconi at this stage. This was not to be a real success but it did not deter Blondy and in 1991 he returned to Europe for a concert tour and to record his famous album Masada with the help of musical legends such as Bocana Maiga and UK reggae producer Dennis Bovell. The album, with its hit single "Rendez Vous", was a huge success, and Blondy was later to receive his first Gold Disc in Paris. Blondy's psychiatric treatment continued but on 10 December 1994, he was back with the festival in memory of President Houphouet, and later he made his European comeback at a storming concert at Le Zenith in Paris. In 1996, Blondy released a hits compilation and went back into the studio to record the album Grand Bassam Zion, singing in six languages: Malinke; Arabic; French; English;Ashanti and Wolof. After two more years in Paris, Blondy returned to his homeland in 1998, with a new album, The Prophet. Convinced his label was too focused on the international market, he decided to create his own label. Since then he has recorded albums and singles, such as "Yitzhak Rabin", in memory of the Israeli prime minister who was assassinated in 1995 (this was accompanied by a grueling tour of Europe), the single "Journaliste en Danger" from his 2000 album Elohim. Alpha Blondy celebrated 20 years as a recording artist with the 2002 release of CD MERCI, featuring Ophelie Winter and Saian Supa Crew, which earned him a 2003 Grammy Award nomination for "Best Reggae Album". However, due to the political situation in Ivory Coast, he was unable to personally attend the award ceremony in New York City. In an unprecedented move, the Grammy Awards permitted him to send a representative in his place of honour. In 2005 Akwaba was released. His CD Jah Victory was released July 2007. It features Sly Dunbar and Robbie Shakespeare, as well as Tyrone Downie formerly of Bob Marley and the Wailers. "Victory" is in honor of the peace agreement that was reached and implemented in the Ivory Coast in March 2007. On 13 June 2010, a large crowd was allowed into a Blondy concert in the Ivory Coast to celebrate the peace and unity of the country. Overcrowded conditions at the concert resulted in at least 20 people being injured, two of whom died. Alpha Blondy was born to a Muslim father and a Christian mother, and was brought up by a grandmother "who taught him to love everyone". Blondy's respect for all religions and the spirituality he derives from them can be heard on the tracks “God is One” or “Jerusalem” where he sang for unity between all religions in 1986. In 2005, Alpha Blondy was named United Nations Ambassador of Peace for Côte d'Ivoire. He made great efforts to bring about a peaceful solution to his country's political and physical division which was a result of an attempted coup in 2001. As of March 2007 a peace agreement was signed and implemented, due to the hard work of many people including Alpha Blondy. Alpha now reaches out further with the newly created not-for-profit, non-government, non-political, charitable foundation, Alpha Blondy Jah Glory Foundation, which works towards ending social injustice and generational poverty by giving people the tools that they need to help themselves. He strongly believes in helping the poor (Jah Glory), and also that children should not be hurt. The Foundation strives to create and implement grassroots programs at the village level, such as the Women's Self-Sufficiency Micro Loan Program, to teach women who are caring for multiple orphans how to start and manage their own business, to better provide for their families, as well as other sustainable projects, such as the Tafari-Genesis Retreat Camp for Children (Ivory Coast and Burkina Faso). It especially hopes to bring joy and hope to children who have been affected by civil wars, former child soldiers, and those who suffer from chronic life-threatening illnesses, such as sickle-cell anemia, malaria, asthma, etc. Alpha Blondy continues to fight for peace and unity all around the world through music. A recent example is his single “Who Are You” with Ophélie Winter against antipersonnel mines. He has also participated at many humanitarian and charity concerts, such as the concert in Senegal in March 2006 for the eradication of Malaria in Africa (where he appeared along with many other celebrities). He also continues this work in Ivory Coast itself, at his annual free concert at Bassam beach called “festa”. In 2014, he sang On n'oublie pas (written by Serge Bilé) with several artists and personalities including Jocelyne Béroard, Harry Roselmack and Admiral T. This song is a tribute to the 152 victims Martinique of the crash of 16 August 2005, to remember this event and to help the AVCA, the association of the victims of the air disaster, to raise funds. "Yitzhak Rabin" – written in 1995, following the assassination of Israeli Prime Minister Yitzhak Rabin, and dedicated to him. "Ethiopia De Eli Boy Hag"
^ "De Dimbokro à Monrovia". Alphablondy.info. Retrieved April 3, 2012. ^ Interview with Montreal Mirror, September 2003. ^ a b "Alpha Blondy Music". Alphablondy.info. Archived from the original on September 29, 2007. Retrieved March 27, 2005. ^ Barz, Gregory F. "Blondy, Alpha". Oxford Music Online. Retrieved October 15, 2013. ^ a b c Emmanuel K. Akyeampong; Henry Louis Gates. "Blondy, Alpha". Oxford Reference. Retrieved October 15, 2013. ^ "Deaths reported at Ivory Coast Alpha Blondy concert". BBC News. June 13, 2010. Retrieved April 3, 2012. ^ "Ismaël Isaac" (in French). ivoire-music.com. Archived from the original on October 29, 2009. Retrieved October 17, 2009. ^ Roots Reggae Library, (2015). "Alpha Blondy". roots-reggae-library.com. Retrieved January 21, 2015. ^ a b c Daddieh, Cyril K. (February 9, 2016). Historical Dictionary of Cote d'Ivoire (The Ivory Coast). Rowman & Littlefield. ISBN 9780810873896. ^ "Crash du 16 août : " On n'oublie pas "" [Crash of August 16: "We don't forget"] (in French). Martinique France-Antilles. Wikimedia Commons has media related to Alpha Blondy.